The Pew Research Center is this incredible organization that studies everything; and I mean everything (from US demographics, and marital satisfaction, to telephone use and spending habits, to things that effect happiness.) So, when they looked at the factors that effect happiness in retirement (they look at happiness across a wide range of circumstances such as age, home address, marital status and education, etc. ), I listened. 2011 was the year that the first of the baby boomer generation turned 65. And for the next 19 years, the U.S. will see a huge influx of folks entering the age of retirement. In fact, each day a whopping 10,000 Americans will hit the ripe old age of 65. Most Americans are keenly aware of the necessity to plan for their retirement. The problem is, that generally this plan focuses solely on the financial aspect of retirement. But as the Pew study shows, in planning for your golden years, it is wise to also consider your social life in your retirement plans, since it is these personal connections that play such a significant role in your overall happiness. For a great number of Americans, a significant portion of our friendships and general camaraderie comes through our connections at work. This is not only wonderful, but it makes a lot of sense too. We spend the majority of our days at work, and thus have greater opportunity to interact with our co-workers (they are close in proximity, they share a common interest, and we see them at regular intervals). But when we retire, we obviously lose this outlet, and so we need to find other sources for friendship and good times. These are all fantastic suggestions. However, just because you are retired, doesn’t necessarily mean that your spouse, friends or family members are also retired, or that they can (or want to) spend a greater amount of their free time with you. And so, perhaps also looking for other ways to make NEW connections is in order. I mentioned earlier how the Pew Center undertakes a variety of research subject matters. So it is no surprise that they also have studied internet use and use of social networking site in particular. Their studies suggest that internet use is definitely on the rise for older Americans, and that older Americans are in fact, using social networking site to maintain existing friendships and to build new ones. The membership numbers at SocialJane.com definitely support this trend, as a notable percentage of our members are actually of retirement age and regular users of our site. 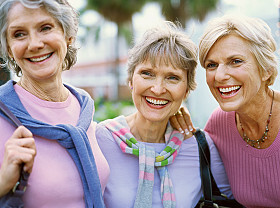 Of course, SocialJane.com is just one resource that seniors can use to build new friendships. Other sites, such as Facebook and Meetup.com are also terrific resources for facilitating friendships, the former for current friendships and the latter for expanding your social circle. We absolutely encourage you to spread your wings in your retirement years and find a new walking partner, shopping buddy, or travel companion within our membership base. We recently heard from two members who met online, both retired and both wanting to do a bit of traveling. A keyword search for “retiree” by one lead to the meeting with the other. Today, they regularly hit new travel destinations together and are having a wonderful time. Nope, they don’t live anywhere near each other, but just because they don’t depart in the same city, doesn’t mean they can’t enjoy some terrific vacations together and a fantastic friendship. Here is to a happy retirement.